Minicraft produces a variety of aircraft kits in 1/48th, 1/72nd, and 1/144th scale, but I always associate them with the wide variety of 1/144th planes they offer. 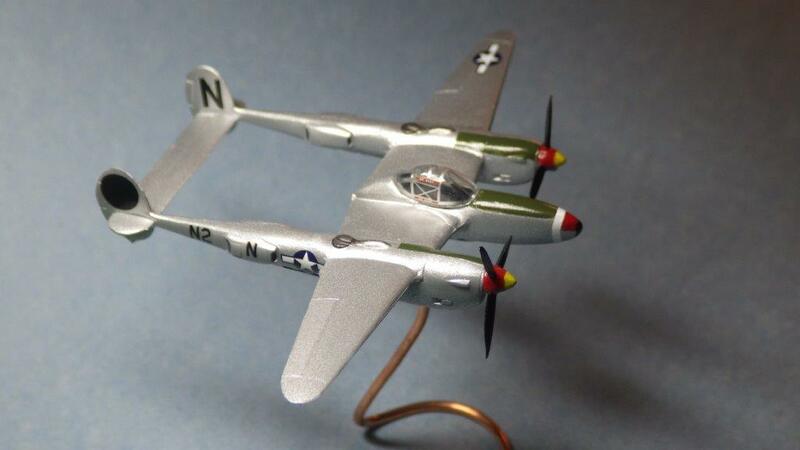 Over the years, Minicraft has released and re-released this version of the P-38 a number of times. Many times it's just a new boxing, or has a different decal scheme, but every time it's been the same kit. 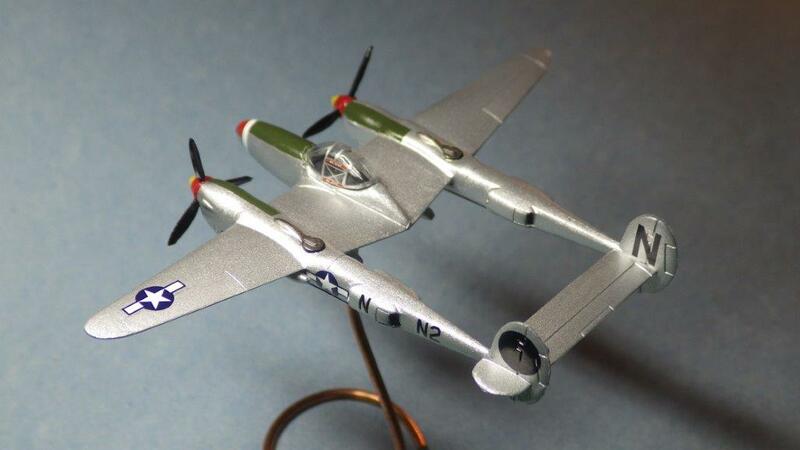 The kit itself was originally the Crown models mold, and like Helen of Troy had a face that launched a thousand ships, it appears that Crown has the mold that launched a thousand boxings of the P-38. The last time I built this kit, it was packaged in a Minicraft/Academy boxing, but the original "new tool" is from 1975. Since that time, this kit has been sold by Crown, AHM, Revell, Minicraft/Academy, and finally Minicraft Model kits. This version is the first to include new parts in the form of a pre-painted canopy. Upon opening the box, which is a nice and sturdy two-part, top opening box, you get three sealed plastic bags and a set of instructions. Two of the bags contain separate canopies, the regular clear canopy, and the new painted canopy. I can't tell you how happy I am to see a painted canopy in a 1/144thscale kit. Having built a number of these "braille scale" kits, I can say the canopy painting is the worst part of finishing them. Having a pre-painted version is great and I hope other manufacturers take note. The kit itself consists of 3 grey plastic sprues. The decal sheet is printed by Cartograf and looks great. To my surprise, the decal sheet includes decals for the canopy frames for people who don't want to use the pre-painted one. In spite of these great additions, the kit shows its age. There is no cockpit, no aileron balances, the landing gear and tires lack detail and the shape of the nose looks off, even while attached to the sprue. Another shortcoming is the lack of guns on the nose. In 1/144th, I'm willing to overlook some details, but leaving off the very prominent .50 caliber guns and 20mm cannon on the P-38 is a bit much. Surprisingly, the sprues themselves are relatively flash free, with just a few spots that will need some work. The kit provides 2 sets of spinners, one with propellers and one without propellers intended to show the plane in flight. The last time I built this model I did it with gear down, but I didn't have room in the nose, or engine nacelles to put enough weight to keep it from being a tail sitter. This time I built it in flight using a small piece of copper wire for the base. Building the kit went fine. The instructions are simple, and so was the build; however, you are going to need to use some filler around the wings, and under the canopy. The canopy fit will need some attention. I ended up using a few small pieces of thin plastic strips, which I carefully sanded down until I got the canopy to sit correctly. The decals are great. They include markings for two bare metal P-38s, one from the 434th FS, 479th FG, 8th Air Force, piloted by LTC James Herren (England, June 1944). No invasion stripes decals are provided, so you'll need to add those yourself. The second set of decals is based on a plane from the 383rd FS, 364th FG based in England in 1944. This one is more basic, but does include some colorful markings on the nose and propeller spinners. I choose to go with the second option, because I really didn't want to deal with painting the invasion stripes. The decals worked really well, although the white nose stripe took a bit of work to get it to sit correctly. I'm happy with the end result, and think it's a nice, if somewhat simplified depiction of the P-38 in flight. 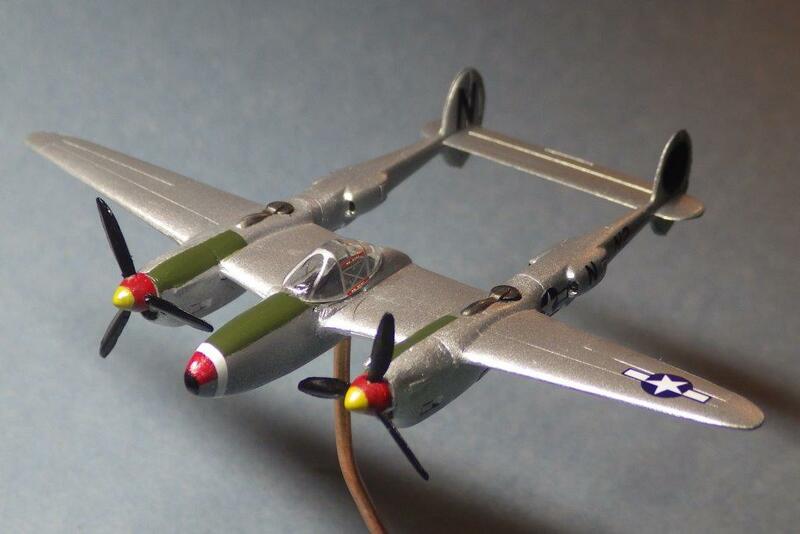 For people who play Flames of War, a WWII tabletop miniatures wargame, this kit is probably the least expensive option for adding a P-38 to your army. While this kit is not without some issues, it goes together quickly and comes with some nice decal options at a reasonable price. Thanks to Minicraft Models and IPMS for this review kit.